Oh my! My oh my! Die Fürstliche Familie von Liechtenstein Eine Fotoreportage (van eck Verlag: 42 Euros) is an absolutely splendid book. One of the best royal books of the year. Books about the Princely family of Liechtenstein are few and far between. Books about the Prince Family of Liechtenstein with a German-English text is even more rare. Yes, this nearly 300 page book is in German AND English! Hip hip hooray for Liechtenstein publisher van Eck Verlag, which is the publisher of Uve Harder, a photographer who has spent many years taking photographs of the Princely family. The life long friendship between Prince Hans Adams and Ute Harder has led to this book, which chronicles three generations of the Princely family. All of the photos are in black and white, and, naturally, the focus is on the Prince and Prince of Liechtenstein and their eldest son, Hereditary Prince Alois and his family. Harder also includes a small selection of photos of Hans Adam's siblings and their families, and his younger children. The final dozen pages honor the late Prince Franz Josef and Princess Gina, the parents of the reigning Sovereign Prince. Franz Josef and Gina died within weeks of each other in the fall of 1989. The focus on the main branch includes a selection of photos from the weddings of Hans Adam to Countess Marie Kinsky and Alois to Duchess Sophie in Bavaria. Liechtenstein's National Day is celebrated on August 15, and members of the Princely Family play major roles in the national celebrations. Harder and his camera are always present for these celebrations, and he has snapped the celebrations for some years. Nearly 200 pages are devoted to photographs of the national celebrations, beginning with 1993 through 2012, although not all years are included. 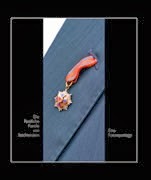 The subtitle of the book is Eine fürstichle jedoch ganz normale Familie, which translates to "A princely, but perfectly normal family." What makes this book truly special is that none of these photos are formal or official portraits. Every photo is a open candid shot, not staged, thus offering a view of a "perfectly normal family." This book is a true treasure, especially due to the limited number of books on the princely family of Liechtenstein. If the book is a success, perhaps the publisher will do another book on the Princely family. 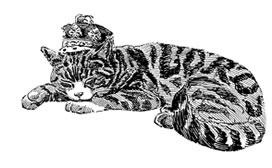 I suggest a book on princely weddings. The book is available from the American, British and German Amazon sites. If you have an account on Amazon, you also can order from all the other Amazon sites. The Dutch bookstore, Van Hoogstraten, also has copies for sale. http://www.hoogstraten.nl/theshop/index.php Type Liechtenstein into the search box. The fall of communism and the Soviet Union has brought many changes, including the opening of the state archives to historians. Although the Soviets destroyed much of the history of Imperial Russia, historians and biographers continue to find a treasure trove of photographs and documents, including letters and diaries. Galina Korneva and Tatiana Cheboksarova are Romanov specialists based in St. Petersburg, Russia, who have had unprecedented access to the once forbidden archives, and have written several books. Most of their books have not been translated into English. This is sad, but understandable because good translations are an expense that most publishers do not want to undertake, Books on royalty are among the least translated largely due to the knowledge that royal books do not make the bestseller lists. A round of applause to Eurohistory for publishing Galina and Tatiana's latest book, Russia & Europe Dynastic Ties. This book includes nearly 600 photographs from Russian and European archives. Eurohistory owner Art Beeche has expanded the original edition by adding photographs from his own collection. The title refers to the royal ties between the Romanov and the European and British Royal Families, mainly through marriage. The authors begin their book with a chapter of Alexander II, his consort Marie Alexandrovna (born a princess of Hesse and By Rhine) and German Emperor Wilhelm I.
Wilhelm's sister, Charlotte, was the mother of Alexander II. She converted to Orthodoxy at the time of her marriage to the future Nicholas I, taking the name Alexandra Feodorovna. This marriage brought a German influence to the Russian Court. Charlotte's daughter, Olga, and her family is featured in the chapter on the Württembergs. Olga married King Karl I, and spent more than 40 years in her adopted country, where she established several charities supporting women. Karl and Olga were childless, so they adopted Olga's niece, Grand Duchess Vera Konstantinova, who thrived in her new home. She "further strengthened" the ties between Russia and Wurttemberg, when she married one of Duke Wilhelm Eugen of Württemberg. A Württemberg princess Friederike Charlotte Maria came to Russia in 1824 to marry Grand Duke Michael Pavlovich. A "very independent character," Grand Duchess Helen Pavlovna took on numerous charitable works. It was during the Crimean war that Helen's support for professional nurses that allowed for nurses to travel to the battlefronts for the first time. 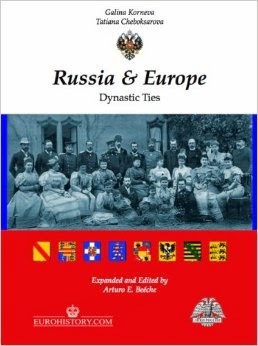 What makes this book different is the authors' determination to focus not only on the main Romanov lines, but also on the Hessian siblings, Alix, Ernie and Ella, delving into the myriad of ties between Russian and Hesse and by Rhine, the Grand Duchy of Mecklenburg-Schwerin (thanks to the marriage of Grand Duchess Anasastia Mikhailovna to Grand Duke Friedrich Franz III), and the family of Princess Dagmar of Denmark -- the future Empress Marie Feodorovna, consort of Alexander III. There are also chapters on Grand Duke Constantine and his family, Queen Olga and the Greek royal family, and Grand Duke George who married Princess Marie of Greece..
Every foreign marriage - princesses who married Grand Dukes and the Grand Duchesses who married into foreign royal families - meant a further intertwining of family connections. A Grand Duchess would settle into her new home, bringing her jewels and her religion, thus maintaining ties with Russia. Russian Orthodox cathedrals and chapels were built throughout Germany. The Russian Revolution ended the 300 reign of the Romanov Dynasty. The Soviets tried to wipe out and destroy much of the Imperial family's history. Thankfully, they did not eliminate everything, and now, nearly 100 years since the Revolution, historians, biographers and everyone else can appreciate the work of Russian historians, including Galina and Tatiana, who have produced a monumental work. This is the first book that offers a true perspective of the family connections between the Romanovs and their spouses and their families. The new family ties also brought new politics, new architecture - Russians influencing Germans and vice versa.